Melissa Wakeboard is your new mentor. Melissa Marquardt customized her pro-model shape with an emphasis to charge in the park or behind the boat. All-terrain versatility is made possible with a triple stringer core and full rails; allowing effortless flow and a killer pop. 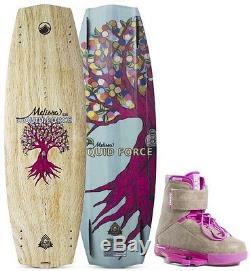 Melissa Wakeboard is the one for those who want to rapidly progress in their wakeboarding game. A major benefit comes from softer landings and a mega-durable base which supports the most aggressive wake sessions. This durable board has aggressive, continuous rocker that will enhance predictability and fluidity for an even better riding style. Go faster, pop higher and learn more on the Liquid Force. Smooth, fluid and exceptional carves. Predictable ride and flowing transitions for a high arcing pop. A performance flex construction process to deliver the liveliest and most finely tuned wakeboards. LF Hybrid tech provides a range of choices for all sizes and styles of ripping. D-I-S-C Hull through the Center. Softens landings and maintains board speed. Elastomeric sidewall encloses the core for increased durability and rail strength. No edge hang-ups on rails while still giving extra grip on the water when needed. CNC Milled Wood / PU Composite. Triple stringers provide central control and responsive tip flex: all precision cut in the perfect hull shape. Along with a thinner profile for increased board response, sensitivity and flex. Provides torsional rigidity with increased longitudinal flex. Get the strongest base possible while maintaining the performance features of each finely tuned hull shape. LF's grind bases mold to the boards contours and provide solid protection all season long. Melissa Wakeboard Bindings designed by pro Melissa Marquardt are not run of the mill. Just like Melissa herself they have the best combination of irresistible confidence and performance. This rad chick wanted to make bindings that deliver a clean carve, a powerful pop yet are light and comfortable for all ladies. By including the articulated cuff and velcro they support a women's calves and promote fluidity in motion. Finally you can wear and rock what the pros do with the Liquid Force. Fluid forward motion of the upper and lower overlays. 3D molded footbed with ergonomic contours. Forefoot lacing and Velcro cuff for a secure custom fit. Seamless design, heat molded, and non intrusive back tweak zone. Injection molded Nylon plastic chassis with metal teeth. Impact absorbing 3D molded liner bottom with ergonomic contours. The item "LIQUID FORCE MELISSA 135 CM HYBRID WAKEBOARD with MELISSA CLOSED TOE BOOT WMNS 7-9" is in sale since Wednesday, November 23, 2016. This item is in the category "Sporting Goods\Water Sports\Wakeboarding & Waterskiing\Wakeboards". The seller is "wakesidemarine" and is located in Elkhart, Indiana. This item can be shipped to North, South, or Latin America, to all countries in Europe, to all countries in continental Asia, to Australia, ZA, to New Zealand.